Hana and Hina are two high school girls working at the same character goods shop, but they are completely different from one another. Hana is petite, uncertain and shy, while Hina is tall, confident, and trendy. Yet they share a secret: their school has a strict policy against taking part-time jobs. They also discover that both of them share an irresistible attraction to things that are cute, be it the uniforms at their all-girls' school or... each other! Just how long will Hana and Hina be able to keep their after school jobs, and their feelings for each other, a secret? Serialization initially started in Comic High! magazine, but after its discontinuance two months later, serialization moved to Monthly Action magazine. Hana to Hina wa Houkago was published in English as Hana & Hina After School by Seven Seas Entertainment from March 14 to November 28, 2017. This is a spoiler free review but I will talk about the basic plot points but its no more spoilery (Is that a word?) than a normal synopsis. Hope this helps! Hana to Hina for the most part has a really well executed story line. Basically what you see is what you get with this manga, Two girls work at the same shop after school, one is basically a model who likes cute things and one is a cute thing that likes the model. This is a spoiler free review however I will say that most of this plot relies on angst, which in a yuri romance manga is pretty standard. There are times the writer could have gone into more detail with certain mini story lines but in the end if you like Yuri Romance, then you will get exactly what you want from Hana to Hina, but not a lot more. 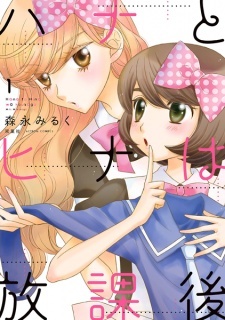 The art (and story) was done by Milk Morinaga, the same person who did the immensely popular Girlfriends. The Hana to Hina character designs and backgrounds are all up to the same standard. I was also very pleased with the fact that even though the main characters had the trademark Milk Morinaga mix of a dark haired bob and a long haired blonde, the characters personality come out more in their designs which separate them from her other work. If you like yuri manga, then you have seen Girlfriends already and know whether this art style is for you. The two main characters are both very likable and it was never a struggle to want these two to end up together. The characters have a personality that never falters throughout and never do anything really unlike them which is essential for the basis of a good story. The bad thing about the main characters is their lack of depth, it makes every minor detail in their lives a huge problem which personally for me is annoying. However they are teenagers so in this instance it won't ruin your enjoyment of the manga, if at all. I really enjoyed Hana to Hina, the story was written well enough so that my immersion wasn't broken unnecessarily and it has all the great parts that any fan of the Yuri genre came for. That being said it doesn't go beyond that and as I've mentioned before I believe with a few (Rather large) tweaks this could have the potential to be one of my top 5 yuri manga, if not top 3, which is disappointing. Overall, if you like a like Milk Morinagas art style, good chemistry between two main character and mind a pinch of angst, then Hana to Hina will definitely be worth a read, even if it probably wont be making anyones top 5 anytime soon.